Avery (far right) says, That's all, folks! Bassist Eric Avery has officially announced his split from Jane's Addiction. This comes after much speculation as to his commitment to the band, and hot on the heels of the group's just-completed Australian tour. "That's it," Avery Tweeted. 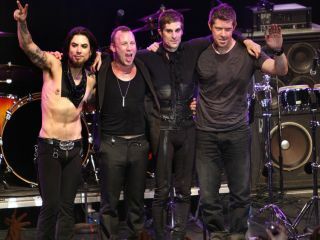 "With equal parts regret and relief, the Jane's Addiction experiment is at an end." Earlier this year, Avery Tweeted that he was not participating in the band's writing sessions. Alluding to Avery's resignation, singer Perry Farrell Tweeted, "Slipping out of that shell of a past. Wow we're on to something faster now. And so worth the wait." Adding perhaps final punctuation to the matter, guitarist Dave Navarro wrote on his Twitter account yesterday, "Yes, Eric Avery has left the band. More to come but we wish him all the best!" Which now brings us to the matter of Duff McKagan, the ex-Guns N' Roses and current Velvet Revolver bassist who has been hotly rumored to be working with Jane's. In January, Farrell Tweeted that "David, Stephen, and I with new writing partner, went into the garage. Felt like old days, except no cassette recorder. Crafting w/Protools." He made no mention of McKagan by name, but word spread quickly who the 'new writing partner' was. Speaking to Rolling Stone recently on the state of Velvet Revolver, Slash had this to say: "I think Duff [McKagan] is doing something with Jane's Addiction right now so we're all sort of all over the place doing whatever until we can all regroup." MusicRadar has contacted Velvet Revolver's management, who have yet to issue any kind of formal response.